Jabiru is a town in the Northern Territory of Australia. Bring the kids along to Anbangbang Billabong and Cahills Crossing. Spend the 25th (Thu) exploring nature at Jarrangbarnmi / Koolpin Gorge. 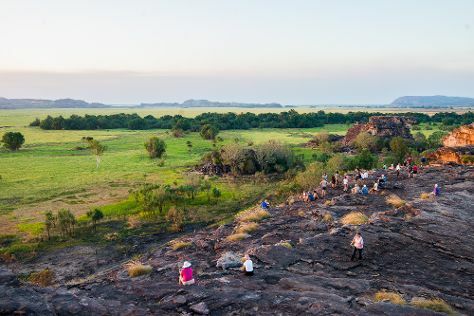 There's lots more to do: explore the ancient world of Ubirr, explore the striking landscape at Maguk Gorge, see the interesting displays at Warradjan Cultural Centre, and explore the activities along Jim Jim Falls. To find reviews, other places to visit, more things to do, and tourist information, use the Jabiru (Kakadu National Park) trip planning app . Singapore, Singapore to Jabiru (Kakadu National Park) is an approximately 12.5-hour flight. The time zone changes from Singapore Time to Australian Central Standard Time (Northern Territory), which is usually a 1 hour difference. You'll set off for home on the 28th (Sun).